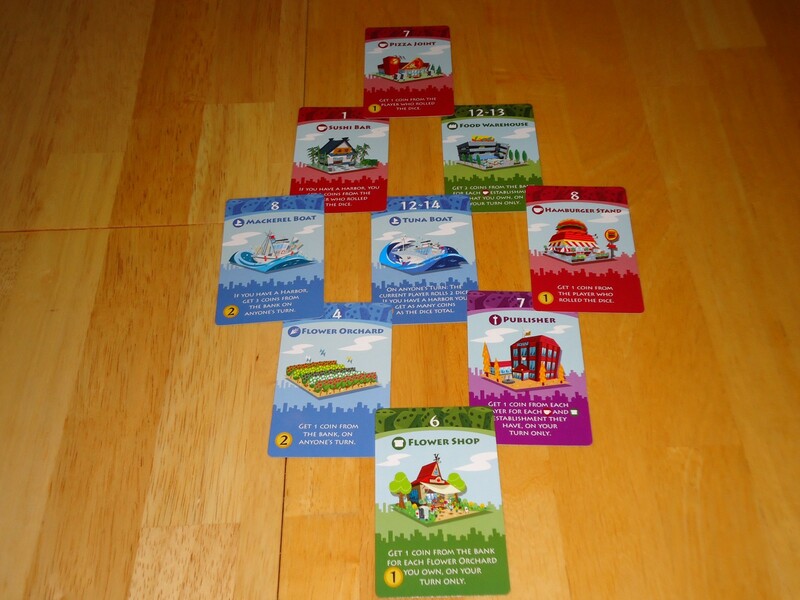 You’ve built your city in Machi Koro and become the Mayor that everyone loves. But, as with all politicians, you crave more. More Establishments! More Landmarks! More ways to make money! Machi Koro – The Harbor Expansion answers your pleas by giving you a little bit more of everything to work with. The question that has to be asked is this: Is more better, or is it just more? 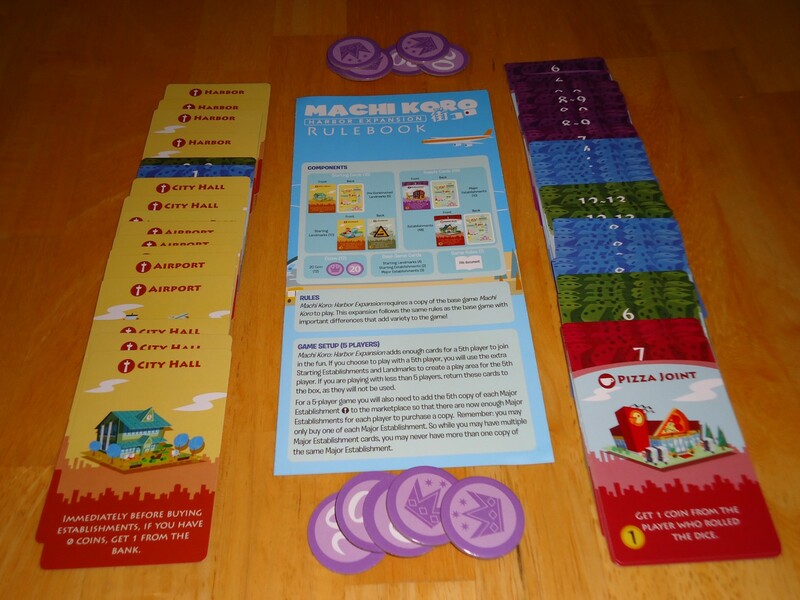 Machi Koro – The Harbor is an expansion to Machi Koro and you will need the base game to play. This expansion allows for the addition of a fifth player and also introduces several new Establishments which have new effects and income potential. All of the rules of the base game remain in effect, although there are some changes to the setup that introduce more variability into the game play. The most significant change is how the Marketplace is set up. In the base game, all of the Establishment cards were stacked and made available at the beginning of the game. 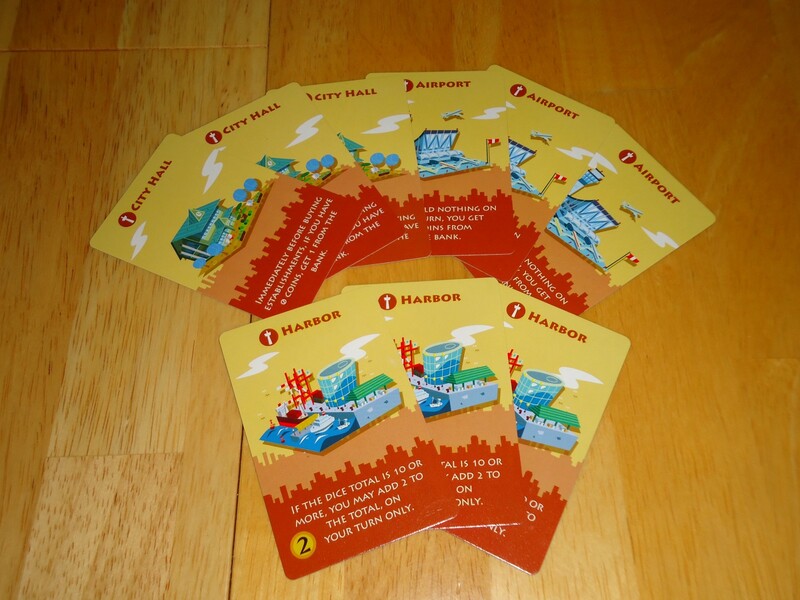 Now, all of the Establishments from the base game and Harbor are shuffled together to form a single draw deck. Ten cards are drawn from this deck and placed on the table to form the Marketplace. If you draw a card that is already in the marketplace, place that card on top of the original one and draw again. Keep doing this until you have ten unique Establishments on the table. As cards are bought during the game and the number of unique establishments drops below ten, replenish the Marketplace using the same rules described above until you once again have ten unique establishments. If a Major Establishment is drawn but all players already own that Establishment (meaning it cannot be purchased because players can only have one of each type of Major Establishment), discard it and draw again. If there are Major Establishments already in the Marketplace which can no longer be purchased due to the same rule, remove them from the Marketplace and replenish accordingly. If the draw deck runs out, the Marketplace is not refilled for the rest of the game. The final change is that Harbor adds two more new Landmarks: The Harbor and the Airport. Their presence changes the victory condition from being the first player to build four Landmarks to being the first player to build all six Landmarks. More Machi Fun or Mucho Machi Bloat? The Harbor expansion is one of those add-ons that doesn’t seem to amount to much, but which changes the base game in significant ways. What you get in the box is basically just more cards and some new money tokens. But sometimes more really is better. The base game needed more cards to improve the longevity and variability of play. Having more Establishments that provide some new rewards and risks is a beautiful thing. But it’s the new Marketplace setup that makes Harbor shine. In the base game, all of the Establishments were available at the beginning of the game. Harbor introduces a limited (only ten unique Establishments are on the table) and variable (Establishments are dealt and replaced from a single draw pile) Marketplace. This forces players to think on the fly. One of the problems with the base game was that certain strategies could be learned and, as long as the dice went your way, would almost always win the game. Other players just had to hope that the dice didn’t go your way. Now you need a bit of help from both the dice and the Marketplace in order to do well. It levels the playing field and gives inexperienced players more of a chance. Harbor also corrects the runaway leader problem that the base game had. If one player rolled lucky in the base game they could quickly buy the good cards and get their engine rolling, leaving everyone else in the dust. Now you may roll lucky but if the card you need isn’t in the Marketplace, you’ll have to settle for something else or just hold on to your money until your next turn. It’s still possible that someone’s luck runs perfectly and they run away with the game, but the odds are lower now. Some of the new Establishments. There are some potential negatives to the Harbor and whether you see them as such will be a matter of personal preference. The first is that, now that you have to build two extra landmarks, the game takes longer. It’s not ridiculously long, but what was a 20 – 40 minute game becomes a 30 – 50 minute game. 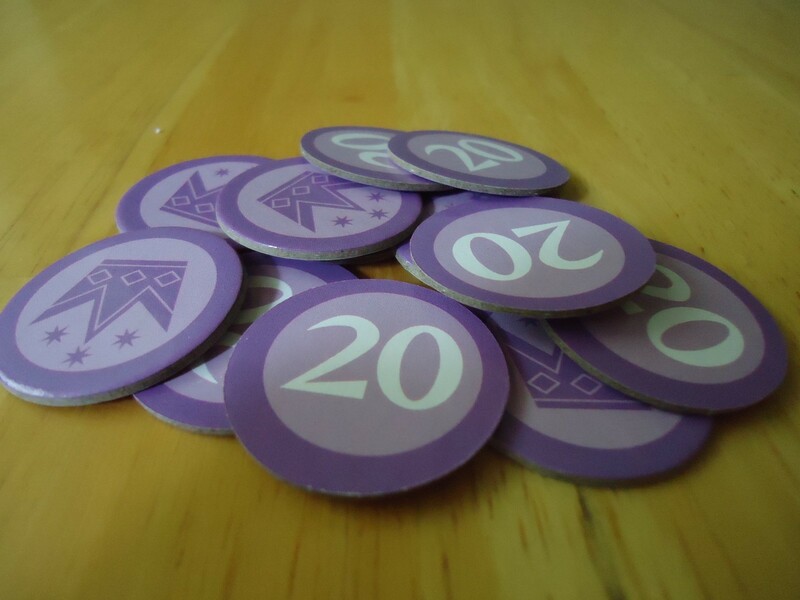 Giving each player the City Hall Landmark at the beginning of the game keeps the extra time from being worse, as getting one coin before building means that more players can build something on each turn and keep things moving along. The variability of the Marketplace also means that sometimes the game can take a while to feel like it’s really getting going. There may be expensive cards in the Marketplace that no one can buy and this can make early turns seem futile. However, once the game gets moving, the extra cards make for more interesting strategies, combos and options, so it ends up being a wash. This doesn’t happen all of the time; it just depends on the draw of the Marketplace cards. Which brings me to the next potential negative of the Harbor: Randomness. While the base game was pretty random with the roll of the dice determining almost everything, Harbor adds the randomness of the ever-changing Marketplace. In the base game, you always knew what was available and could plan accordingly. Now the luck of the draw determines which Establishments are available and planning is a bit more limited. While many people consider this to be an improvement over the base game, some people think that it just takes what was already a random game and makes it even worse. How you feel about that will depend on your personal tolerance level for randomness in a game. With more to buy, you’re going to need more money! Two other potential problems are linked to the randomness issue. The first is that some cards can feel overpowered. There are some new Establishments (Tuna Boat, I’m looking at you) which can yield huge rewards if the dice go your way, leaving everyone else at the table hating your guts ands struggling to catch up. As a result of some of these more powerful Establishments, there is also a lot more money stealing in Harbor. Sure, this happened in the base game, but it happens more often in Harbor. As a result, people who are sensitive to losing boatloads of money thanks to an unlucky roll of the dice are likely to have their feelings even more dinged. If you liked Machi Koro, you’ll probably like this expansion as it adds enough to make the game more interesting without bloating it up. However, it is worth noting that you can play the base game with the new Marketplace rules. This allows you to introduce the variability from the expansion without adding the extra time or dealing with some of the overpowered cards that come with the expansion. I have tried this and it’s a good compromise if you want the extra variability in play, but aren’t sure whether the expansion is for you. If you hated Machi Koro, whether this expansion saves the game for you is going to come down to personal preference. Some people feel that the increased variability greatly improves their feelings for the game and makes the game into what it should have been from the beginning. On the other hand, some feel that the extra time, randomness, and potentially overpowered cards ruin what was a simple, elegant game. And those who developed winning strategies in the base game may no longer be fans as those strategies don’t work as often anymore. Fortunately, the expansion is priced low enough that you can take a chance on it and not feel too badly if you end up not liking it. Or, you can just try playing the base game with the expansion rules and see how that goes before spending the money on the expansion. I find Harbor enjoyable. I appreciate the chance to play with new Establishments and play in my city for a bit longer. I’m one of those people who always wants more “stuff” in any city building game. It’s why I buy every expansion for Suburbia and every expansion pack for The Sims. I also liked the new variability of play and found that it improves on a lot of the limitations of the base game. Then again, I enjoy a lot of randomness in games, so not knowing what is coming out in the Marketplace is a mechanic that brings me joy. We don’t play base Machi Koro in this house anymore. Even if we’re playing with new players and we don’t want to burden them with the expansion, we play the base game with Harbor’s Marketplace rules. It makes the game so much more enjoyable for us. New setup introduces variability into play, as Establishments appear randomly and are not always available. The new Marketplace rules correct the runaway leader problem from the base game. Inexperienced players have more of a chance now that the Marketplace keeps changing and experienced players have to think on the fly. Adds components for a fifth player. The extra Landmarks needed to win add time to what was a very short game. If you had a favored strategy from the base game, it's probably not going to work, now, thanks to the new Marketplace rules. The dice are still random and the changing Marketplace adds more randomness. There is a lot more stealing of money which may upset sensitive players. Previous ArticleGC ’15: Flick ‘em Up!